Sound Radio Wales spent the morning with the Conwy County Council Highways Team to learn what work goes into treating a road to minimise snow and ice on North Wales roads. 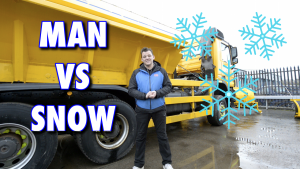 Big Al spoke to Open Area Manager of Conwy County Council Peter Barton-Price about how they know when to grit roads, which roads to grit, why various roads are gritted than others and safety when traveling behind a gritting lorry. We also take an in-depth look into how a gritting lorry works inside and out.